To help make your baby shower easier to plan, here is a cute printable Angel Poem baby shower invitation. 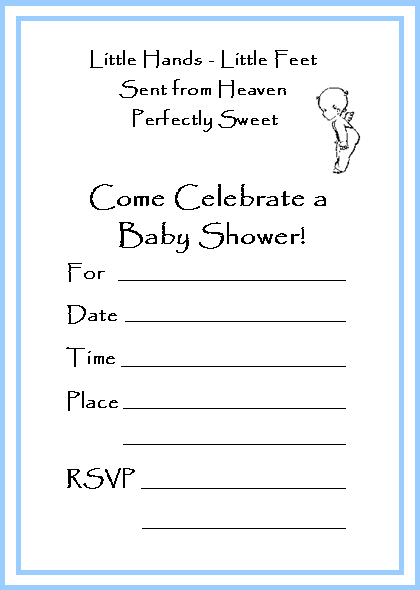 This invitation is an adorable and EASY way to invite your guests to celebrate a new little angel. Just follow the printing instructions (below the first invitation graphic). Below you will find 4 different colors of the same invitation. One is for a girl shower, one is for boy shower, and the 3rd and 4th color combitinations are for either gender or Twins. Just select the invitation color that best fits your shower and print as many as you need!! I hope you enjoy this Angel baby shower invitation! There are several ways to print this baby shower invitation. Whichever way you choose, I suggest that you print your invitations on a thicker cardstock for a higher quality invitation. The EASIEST way to print this invitation is to open this pdf printable Angel poem baby shower invitation and print it from there. You will need Adobe Reader (the latest version is recommended) installed on your computer in order to open and print this Angel invitation. You can get Adobe Reader for free here (a new window will open so you can download without leaving this page). After printing these invitations out, all you need to do is fill in your baby shower details, address your envelopes and get them in the mail! These free printable invitations should give you a head start in your baby shower planning. I hope this baby shower invitation helps you plan a wonderful Angel baby shower!